Whether butter chicken appears on your menu on a regular basis or not, you’ll want to give this recipe a try. Traditionally made butter chicken, like many comfort foods, usually requires a serious time commitment to be made well at home. That’s not the case with our instant-pot butter chicken! Use the counter top pressure cooker to develop the same deep, flavorful curry in 35 minutes instead of hours of simmering. This recipe is a real game changer and is sure to be added into your regular dinner rotation. Share the recipe with friends and family on Facebook, Pinterest, Instagram, and Twitter. 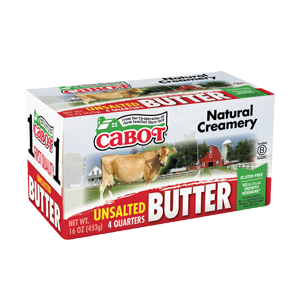 Begin by melting the Cabot Unsalted Butter and sunflower oil together in the bowl of the instant-pot on the sauté setting. Add the diced onions, stirring to coat and cooking until fragrant, about 1 to 2 minutes. Add the 1 ½-inch chicken tender pieces and stir. Cook until the chicken is opaque, approximately 10 minutes, stirring frequently. Next, stir in the minced garlic, curry powder, red curry paste, garam masala, ground ginger, cardamom pods (see note below), and tomato paste, stirring until fragrant and everything is evenly distributed. Turn off the instant-pot and stir in the unsweetened coconut milk until a smooth sauce forms around the chicken. Fix the instan- pot lid in place, set the top knob away from vent and manually set the pressure to HIGH for 10 minutes. When the cooking time is up, carefully turn the knob on top to “vent”. Remove the lid and remove the cardamom pods. Stir in the Cabot Plain Greek Yogurt until you have a smooth sauce. Serve the butter chicken over hot cooked basmati rice and garnish with fresh cilantro leaves, if desired. Note: To make it easier to remove the cardamom pods after cooking, you can add them to a little square of muslin tied with kitchen twine or to a fillable tea bag. Looking for a chicken dish that’s made in the slow cooker? Try this Slow Cooker LightenUp! Rotisserie Chicken Chili! Did you know that Cabot is a co-operative of over 800 farm families who all work diligently to produce only the highest quality products? 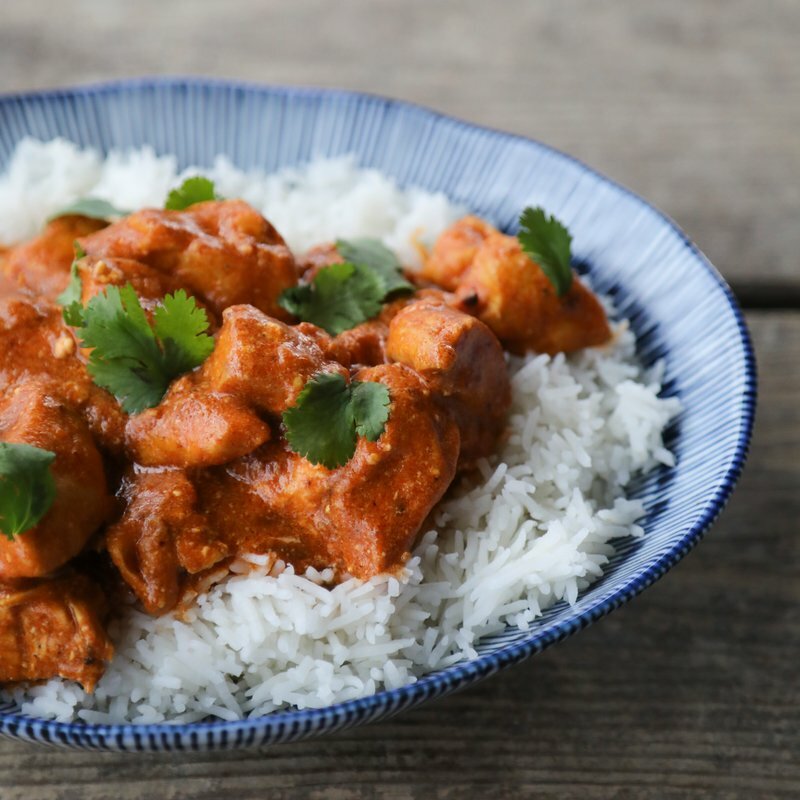 We’d love for you to share your thoughts about this Instant-Pot Butter Chicken so, if you could rate and review the recipe once you’ve given it a try, we’d really appreciate it! MELT the butter and sunflower oil together in the bowl of the Instant Pot on the Sauté setting. Add the onions and stir to coat, cooking until fragrant, about 1 to 2 minutes. Add the chicken and stir. Cook until the chicken is opaque, stirring frequently, about 10 minutes. STIR in the garlic, curry powder, red curry paste, garam masala, ground ginger, cardamom pods, and tomato paste and stir until it is fragrant and it is all distributed evenly. Turn off the Instant Pot and stir in the coconut milk until a smooth sauce forms around the chicken. FIX the Instant Pot lid in place, set the top knob away from vent, and manually set the pressure to HIGH for 10 minutes. When the cooking time is up, carefully turn the knob on top to “vent”. Remove the lid and remove the cardamom pods. Stir in the Cabot Greek yogurt until you have a smooth sauce. Serve the Butter Chicken over hot cooked basmati rice. Garnish with fresh cilantro leaves. COOK’S NOTE: You can add the cardamom pods to a little square of muslin tied with kitchen twine or a fillable tea bag to make it easier to remove after cooking. Loved this! So easy to make and delicious...great for the whole family. I didn't have cardamom pods, so used ground cardamom instead and the dish still had amazing flavor. Will definitely make again!